I thought I’d share some more thoughts on the European Pariament Election results. The article looks at some sort order silliness on the London ballot paper and then looks at the success or otherwise of the European People’s Party and the gains and losses in the European Parliament by euro-party. In London, the Liberal Democrats came 5th, failing to win a seat, but next after them was a party called 4Freedoms. This was the first on the ballot paper. It was in fact the slate of the European People’s Party, a role once held by the Tories but Cameron had the Tories walk out of the EPP, thus denying them the opportunity to win votes in the UK and denying them another 20 seats on top of their No. 1 spot; they won 214 seats. This may become important as the European Parliament votes and elects its leadership. The reason for putting themselves on the ballot paper is twofold, one, some expatriate Europeans may prefer to vote for a Christian Democrat slate rather than the Tories and it gave their lead candidate, Jean Claude Juncker the opportunity to collect votes, if not seats. Numbers come before letters in alphabetic sorts and so 4 Freedoms was first on the ballot paper preceding the possibly better known “An independence for the UK”, a split from UKIP. UKIP were below the second fold in the ballot paper in London. I am surprised we haven’t heard more but in the all the noise about UKIP coming first and the growth of the FN in France, I suspect they and Britain’s right wing press don’t want to examine the Left’s routing of the right in Italy and the substantial votes picked up by the anti-austerity left parties in Spain and Greece, also a political view not represented in the UK. 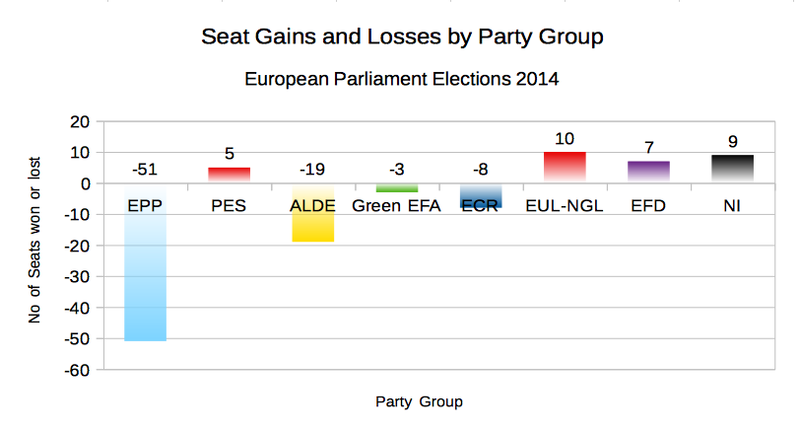 Here’s a picture of the EP parliamentary group’s wins and losses. They are sorted left to right by number of seats won. The EPP is the centre right group, the PES the Socialists includes the Labour Party, ALDE, the Liberals, Green EFA, the European Greens, the ECR, Conservatives and Reformists includes the Tories, EUL-NGL, the United Left, the EFD, various nationalist groups includes UKIP and the NI, which stands for non-aligned but includes the pariah and fascist ultra right including France’s FN and Hungary’s Jobbik. There are 64 seats unallocated to these parties/alliances. Source: Wikipedia; European Parliament Election 2014. Across Europe it doesn’t suggest a victory for anyone really!